When Bobby Bare first arrived in Nashville to advance his music career, he met a songwriter named Mel Tillis, and the lifelong friendship they formed help produce numerous Country Music classics. Bare's first top-10 Country hit was his song "Detroit City" which was written by Tillis. "If Mel hadn't of written 'Detroit City,' I seriously doubt if I'd had a career," Bare said. "I've been very lucky to be friends with so many great people, and Mel was one of the greatest." In addition to the friendship they formed and the songs that Tillis wrote that Bare recorded, they also released an album together, along with Waylon Jennings and Jerry Reed under the group name "Old Dogs." "That's a crazy bunch to have in the studio," Bare recalled. "Jerry Reed said it's the most fund he ever had with his clothes on." While Tillis shined on the stage, it was his life outside of music that left a mark on Bare and so many others. Living with a speech impediment, Tillis chose to live his life filled with joy rather than embarrassment. "He never really overcame it, he just learned to live with it," Bare said of Tillis' stuttering, adding that he would even put it front and center at times to entertain others. Beyond entertaining, Bare said Tillis and he would go fishing, and even if they didn't have a bite on the line, they'd always catch a laugh. "Everybody liked to hang out with Mel because you're guaranteed a good laugh. He had an sense of humor that was unbelievable," Bare said. Bare said one thing many likely don't know about Tillis is that he was a gifted painter. 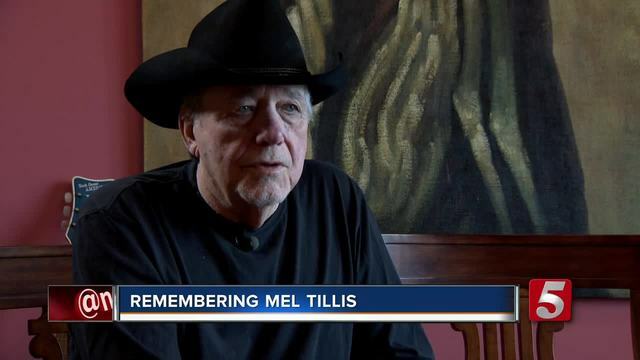 Tillis was a Country Music Hall of Fame member, a member of the Grand Ole Opry, and recorded more than 60 albums in his career, compiling 35 top 10 singles. He was 85 years old.